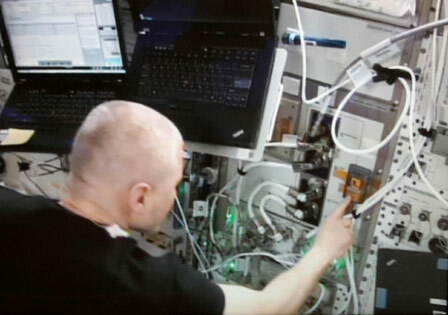 Epiphan’s KVM2USB, a portable KVM over USB device originally developed for Pro AV and IT applications, is successfully being used aboard the International Space Station (ISS) as part of the European Space Agency’s (ESA) Plasma Kristall-4 (PK-4) research mission. PK-4 is a scientific laboratory aboard the ISS run by the ESA as part of their human spaceflight research experiments. Its objectives are to study transport properties, thermodynamics, kinetics, and statistical physics of complex plasmas. Fifteen PK-4 science missions are planned between activation in 2014 and 2020. During operation, scientists on Earth select parameters (pressure, gas flow, plasma voltage, etc.) and initialize the experiment. The resulting particle cloud must be captured by a camera aboard the ISS. Time delays involved in sending and receiving live signals from the ISS make it very difficult for ground-command to accurately capture images of the cloud, so it was necessary to find a way to have the on-orbit crew member perform this task. With no easy way to interact with the PK-4 computers from orbit, a novel solution was necessary. Enter KVM2USB. Epiphan’s KVM2USB lets a laptop computer emulate a keyboard, mouse, and monitor for the PK-4 system, allowing the on-orbit crew to visualize the live VGA video stream, see the particle cloud, and interact with it. KVM2USB also offers the ability to do support and maintenance on the recording computer system. KVM2USB was transported to the ISS aboard the Progress 57P rocket on October 29, 2014 from Baikonur, Kazakhstan. Before accepting the KVM2USB device as part of the payload, it underwent stringent testing for a multitude of factors including reliability, power consumption and temperature. The off-the-shelf retail KVM2USB passed these tests with excellence and was successfully used for PK-4 system activation in orbit on December 8, 2014. The first PK-4 experiments were conducted, with the assistance of KVM2USB, on June 15, 2015. In addition to the June 15, 2015 Plasma Kristall-4 commission experiment, the KVM2USB was again put to extensive use on the third PK-4 mission from October 10–13, 2016 and fourth mission February 13, 2017. 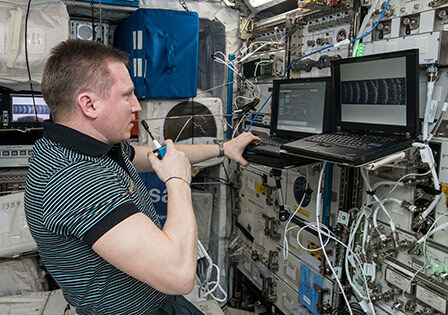 In these campaigns, ISS Commander Anatoli Ivanishin (pictured above) used the KVM2USB to help capture large quantities of particle clouds for study by the on-ground scientific community. Between PK-4 missions, the laptop connected to the KVM2USB is often used to assist other payloads. 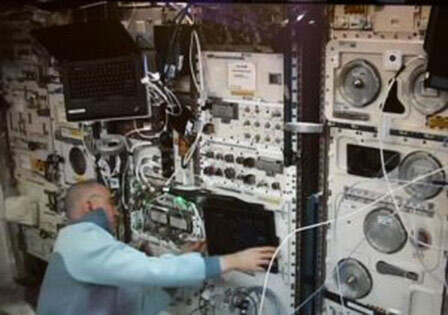 The KVM2USB remains securely installed on the ISS. On July 13, 2018, the Plasma Kristall-4 facility received a hardware and software upgrade to expand it’s science capability. The KVM2USB was used to support the inspection of new equipment. Then during two days of busy science, the KVM2USB played a key role in enabling the on-orbit crew to support the scientific team on the ground in their interactions with PK-4. For the fifth science campaign of the Plasma Kristall (PK-4) facility from November 4 to the 10th, the KVM2SB played a prominent role again as on-orbit crew member Sergey Prokopyev supported scientists in the payload control room in France. Here you can see Sergey capturing the image of a cloud.